Processor-blowhard with flaws. The Envy 17 scores in CPU matters owing to Intel's i7-4700QM quad-core, and it also displays pictures on a matte Full HD screen. 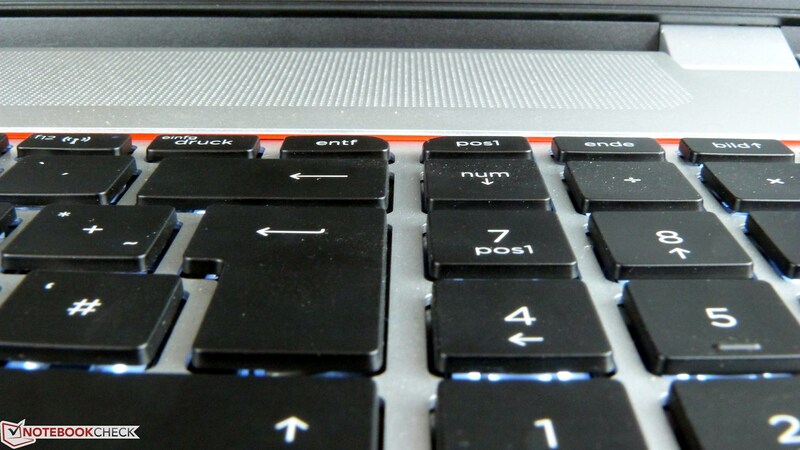 But just how well does the laptop fare in our in-depth test report? Manufacturers have to attract buyers' attention when users begin to consider their laptops to only be simple work machines. Hewlett Packard again and again relies on one of the big mortal sins: "Envy", so jealousy, for this purpose. The Envy product line is to make colleagues and friends jealous of the new high-tech toy with alluring equipment. 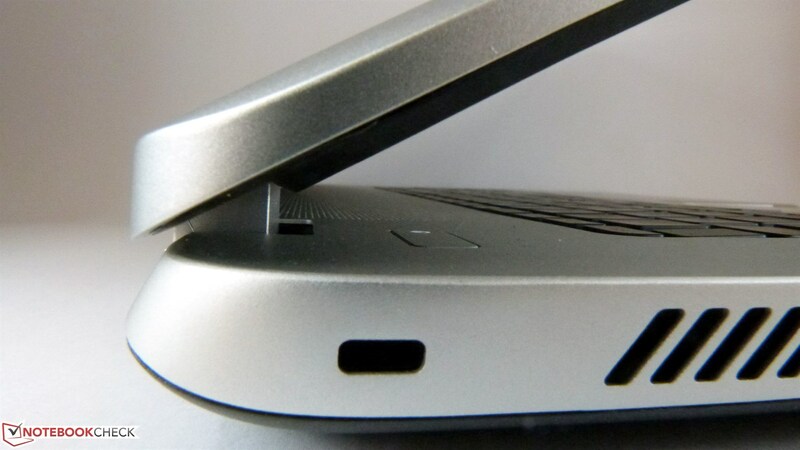 HP actually started the Envy series as very clear competition for Apple's MacBooks. In fact, the current Envy 17-j003sg now in our test looks a bit like the big MacBook. At second glance, however, we recognize that envy can be quite a superficial feeling. 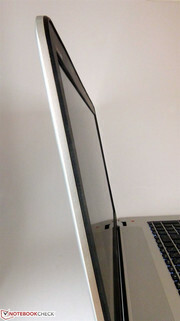 The laptop is only plastic made to look like aluminum and is far from the quality feel that Apple's contender conveys. Because no new 17-inch MacBooks have been produced since 2012, the last equally sized model is not really a contender. Current competitors would be MSI's GE70-i765M287 also with a 17.3-inch screen diagonal and Intel i7-4700QM. However, MSI installs a stronger GPU but a bit less RAM. Acer places itself behind HP with the Aspire V3-771G. An Ivy Bridge quad-core and Nvidia's GeForce GT650M represent components from the last generation and prove just how much more performance the modern CPUs and GPUs have. Toshiba's Satellite S50-A-10H is also interesting because it uses similar components as found in the Envy 17. However, they are hidden in a 15.6-inch chassis. 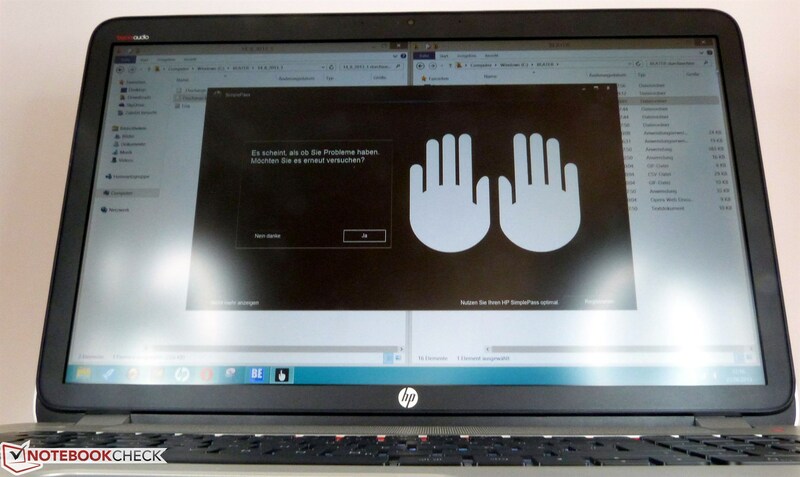 Will we really be jealous of HP Envy 17 owners after this test? 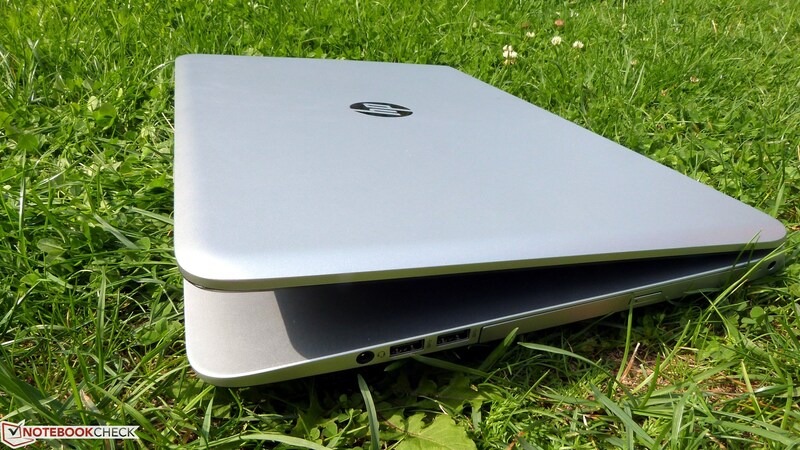 Unlike the Envy dv7, which was coated with matte aluminum, HP now uses silver-colored plastic to at least let the material look like the expensive and higher quality material from afar. Although the Envy 17's casing looks like the somewhat bulky MacBook 17 at first glance, the very scratch-sensitive plastic surface is noticed when looking closer. It is also quite unstable. 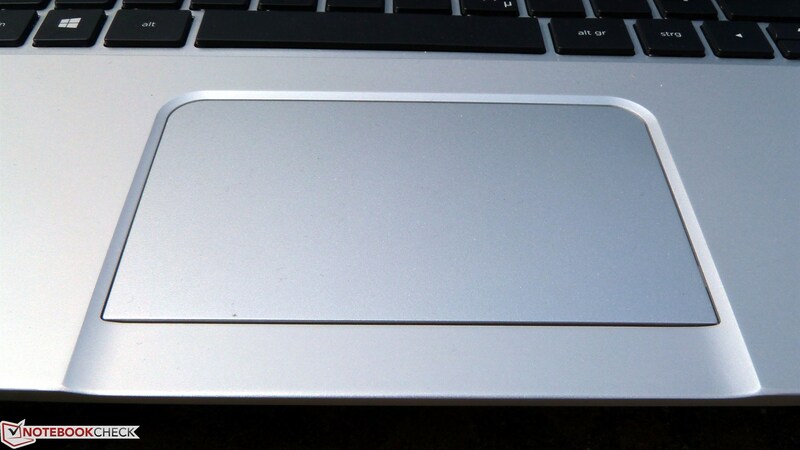 The keyboard partly bends visibly and a creaking sound is heard from the touchpad's area. With a size of 416 x 274.4 x 306 mm, the casing doesn't look too big or too small for a 17-inch model. The weight of 2.85 kilograms (without power supply) is also quite reasonable. 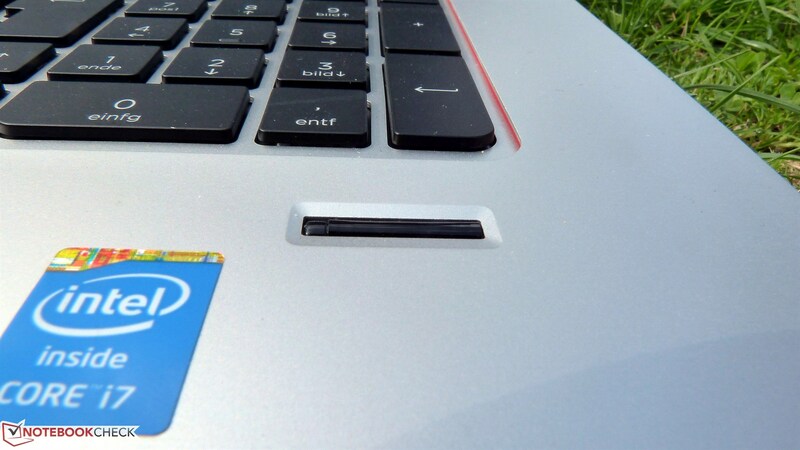 The user looks at HP's logo and a total of two Beats Audio labels when the laptop is placed on a table. The manufacturer uses the back only for self-promotion. 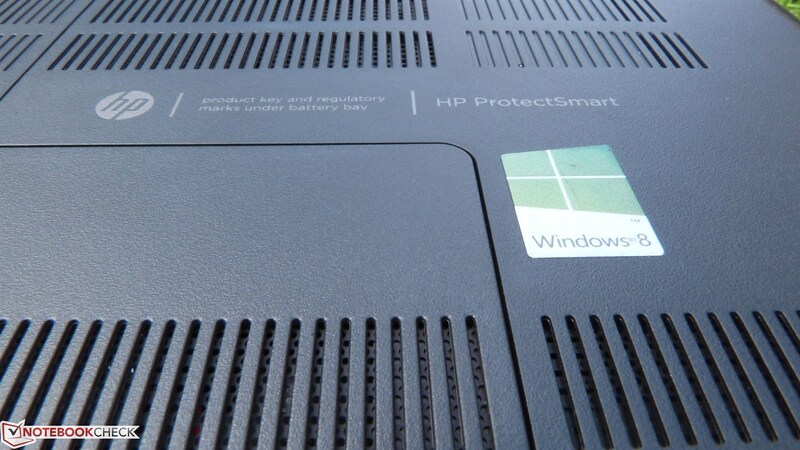 A large HP emblem on the display's back and a Hewlett Packard logo between the display's hinges are here. HP did not pull the hinges very tight so that the display wobbles slightly and it is difficult to keep the laptop open a bit. It simply closes again when the screen is not opened beyond a certain point. The Envy 17 offers a quite decent array of interfaces. It sports a total of four USB 3.0 ports alongside HDMI, Gigabit LAN and an SD slot. It is inconvenient that all interfaces are located in the laptop's front area so that it might restrict the hand's work space when working with a mouse beside the laptop. At least the USB ports are sufficiently spaced so that large sticks will not block other ports. One of the ports also supplies drained smartphones with power even when the laptop is off. HP does not offer goodies like a Blu-ray drive and only installs a DVD burner that also supports the now rare RAM format. HDMI, Gigabit LAN, 2x USB and the SD reader alongside a vent and Kensington lock are cramped on the left. Behind the power socket, the DVD drive dominates on the right. 2x USB 3.0 and the 3.5 mm jack come before it. The front doesn't sport any ports. There is a recess to open the screen. The Envy 17 can be connected to a network with cables via Gigabit LAN. The chip comes from Realtek and proved to be reliable and not too slow in the test. HP implements Wi-Fi using two antennas and the RT3290 module from Ralink. IEEE 802.11 b/g/n is supported with a maximum of 300 Mb/s. However, the 5 GHz band is not available and the Envy 17 only transmits with 2.4 GHz. The Wi-Fi range did not completely convince us. The reception just one story over the router (TP Link) was only middling. A better transmission was possible with a FritzBox but the signal quality varied greatly between "good" and "average". 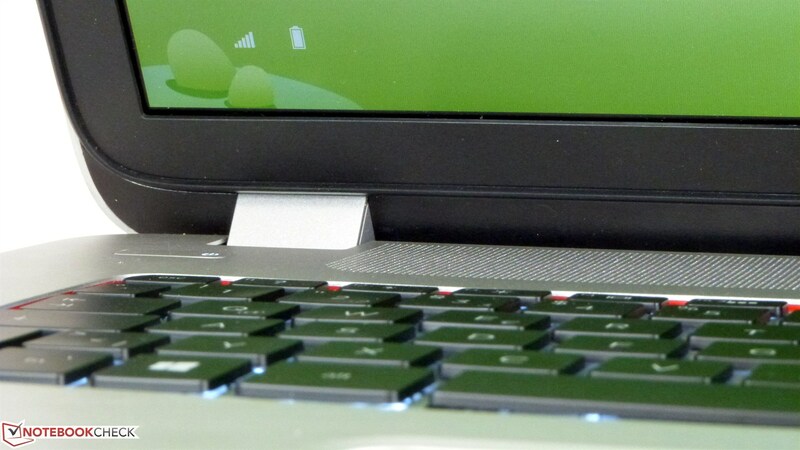 The laptop can be secured against theft via the Kensington slot on the left using a laptop lock. Should the device be stolen anyway, it also features a fingerprint scanner for logging into the device. HP's included security software enables replacing other passwords with a fingerprint so that users can access accounts biometrically. An LED beside the sensor displays whether the scanner is active. Inexperienced users will certainly find the included leaflet useful when turning on the laptop for the first time. However, experienced users will barely find any interesting accessories in the laptop's box. The manufacturer only includes a user's manual, warranty booklet, power supply and battery. So there's no reason for envy. 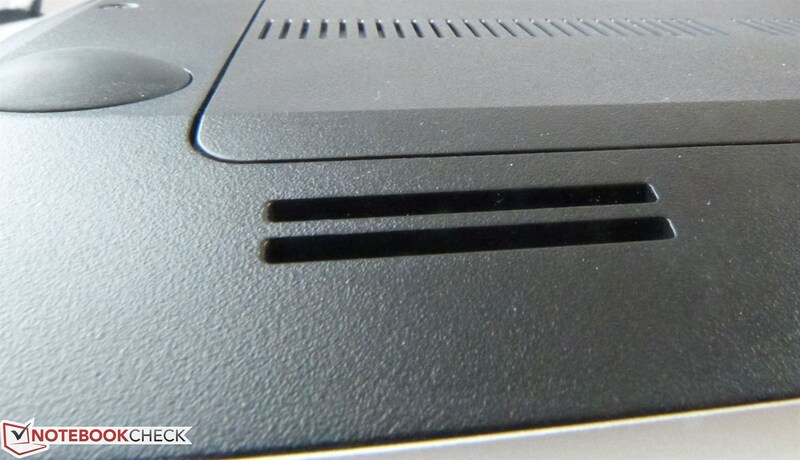 The maintenance cover on the Envy 17's bottom is secured with an easy to remove screw. Underneath the cover, we find the Wi-Fi module, both memory bars, the hard drive and the BIOS battery. The laptop could be upgraded via a second hard drive or SSD but a flat ribbon cable would be needed for this purpose. A hard drive cage would also be very helpful. The memory can only be upgraded when one of the installed modules is removed. HP does not allow the user to access the fans. Cleaning is connected with removing considerably more screws and a rather excessive tinkering with the laptop's innards. 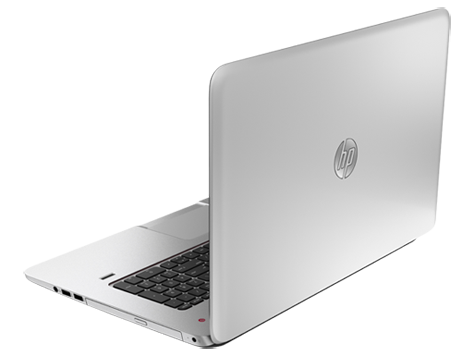 HP delivers the Envy 17 with a 2 year limited manufacturer's warranty. 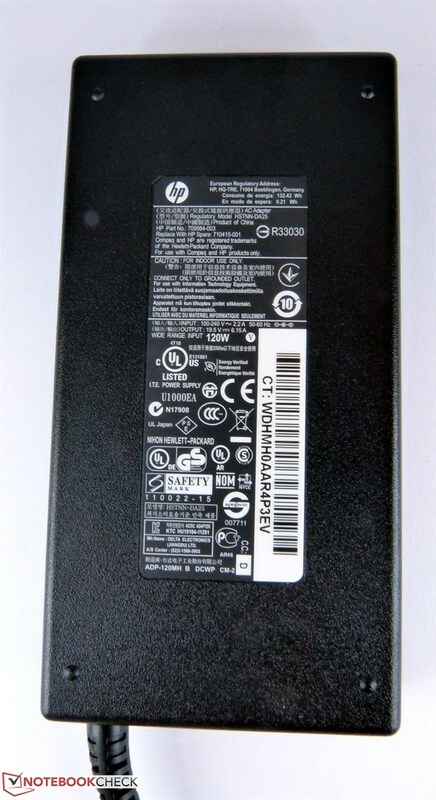 The warranty can be upgraded via HP's websites when required. The options are listed after entering the product number. For example, the manufacturer offers a 3 year upgrade for 168 Euros (~$221) via a service partner. For approx. 240 Euros (~$316), the laptop can be insured for three years including accidental damage, e.g. spills, drops, etc. The keyboard particularly yields towards the center and results in a rather wobbly typing feel. That is too bad because we like the otherwise quite good pressure point which hints at a decent typing feel. However, the spongy bed unfortunately prevented us from finding this. The cursor block is a bit too small but the number pad features an agreeable size. The space and enter keys are sufficiently sized and allow comfortable use. The F-keys have a double assignment which can be triggered via the FN-key. HP has placed a few multimedia keys here. The touchpad's size of 110 x 70 mm is large enough to work with it pleasantly. The finger glides smoothly over the pad and clicks are also easily performed. The entire pad can be pressed to execute a left mouse click. A button for right mouse clicks is implemented in the lower area and is not separated from the rest of the touchpad. 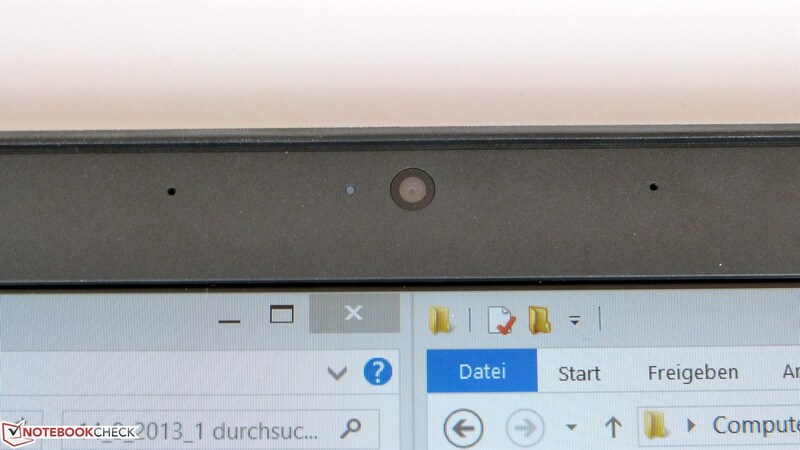 The narrow bar in front of the touchpad can be pressed very deeply and causes the entire laptop casing to always rock while working with it. 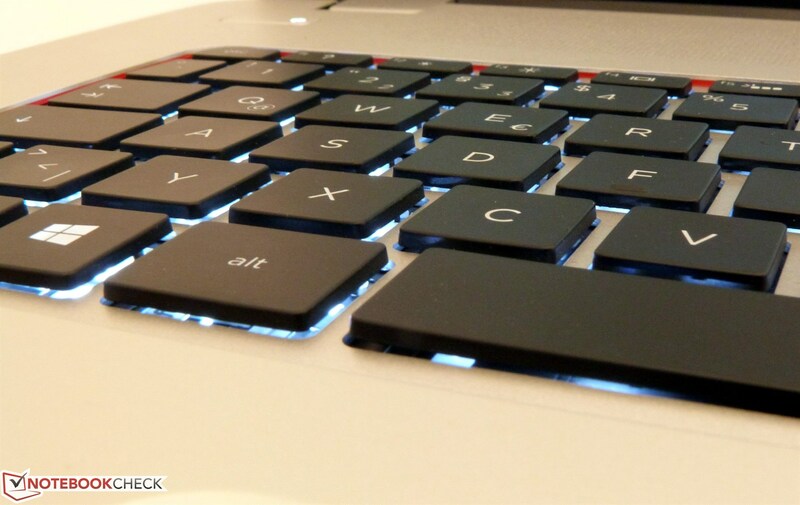 The keyboard can be pressed to a disagreeable extent, but it features a nice illumination. The touchpad's size and accuracy are pleasing. Everything at a glance: A screen resolution of 1920x1080 pixels alongside a diagonal of 17.3-inches is a perfect match as we ascertained in HP's Envy 17. Although it is only a TN display, the screen convinces with a decent color reproduction not just for home use. However, that does not quite make the Envy a workstation for graphic designers. Users who are planning to use the laptop for editing pictures beyond hobby purposes should imperatively calibrate the colors because the screen's bluish cast is then no longer noticed adversely. Both the screen's contrast and black value could also be a bit better. HP does not offer any other screen types for this model. This is not a tragedy because the screen makes a very good impression. Particularly its matte surface is a pleasant and user-friendly solution after all the glossy laptops. 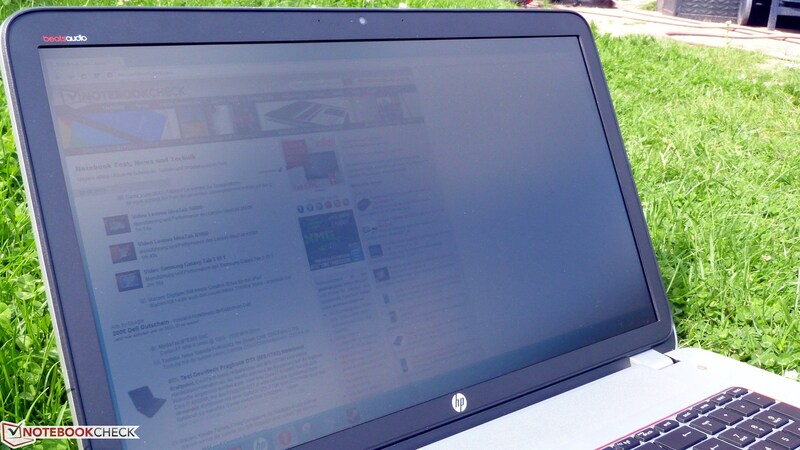 Alongside the laptop's good brightness it even results in an outdoor-suitable work solution. The screen is one of the crucial components in a high-quality laptop. HP only follows this rule to an extent. 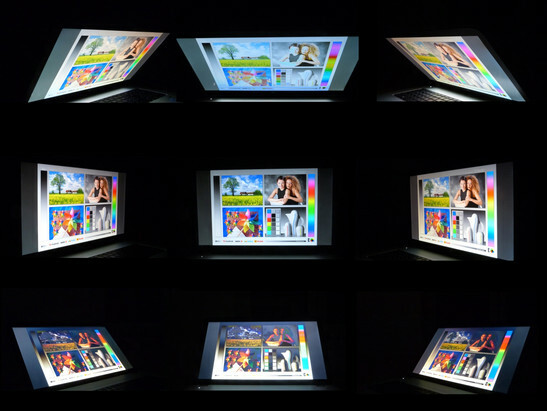 The Envy 17's screen is quite viewing angle dependent and does not have compelling contrasts. However, it scores in color reproduction. The black value of 0.83 cd/m² is not exceptional and the contrast ratio of 343:1 is also only middling. Thus dark scenes in movies do not look as black as they should be. However, the screen proves to be color-rich. The sRGB reference color space is covered up to 92%, which is a good rate. In contrast to that, AdobeRGB is only covered by 63%. The colors should definitely be calibrated to eliminate the screen's bluish cast. It is a bit aggravating that HP did not perform this rather simple picture improvement itself and presents the buyers with a theoretically very good, but practically only a middling screen due to the unperformed color calibration. The screen remains well-legible even in the sun. Even low-contrast web pages remain well-legible in partial shade and regular texts can still be made out in bright sunlight. The user does not carry a makeup mirror around with the Envy 17 and this is also noticed favorably indoors. Ceiling lamps do not disturb work. The viewing angle stability of the Envy 17's is good for a TN screen. Content is well-legible from all sides. The content only fades or inverts quickly from above or below. Thus, not much stands in the way of using the laptop on the thighs or on the living room table. The viewing angles always allow ergonomically work with the Envy 17. This is not an insignificant factor in a device that could certainly replace a desktop computer. Owing to Intel's swift quad-core, a lot of RAM and a dedicated graphics solution, HP's Envy 17 is not only suitable for multimedia use but also as a work machine for video or image editing. Pictures are pleasant to look at and can also be edited on the good screen, and the hardware is fast enough for that to begin with. However, users who need more RAM will have to remove one of the two installed modules. The Envy 17 only sports two RAM slots. However, the Envy 17 is not quite as suitable as a gaming laptop. The GT 740M is not a guaranty for fps even in its highest version from the outset. HP additionally reduces the graphics solution with a slow memory bus. The 2 GB of VRAM doesn't help much here either. The Envy 17 is only suitable for permanent mobile use to an extent due to its 17.3-inch size. Although HP has kept the weight quite low for this device category with 2.85 kilograms, barely anyone will want to permanently carry around such a bulky device. Nevertheless, it is still handy enough to carry from the office to the living room and thus the laptop is quite suitable for use as a desktop replacement. The processor reduces its maximum Turbo clock during load. HP's Envy 17 definitely does not lack processor power. Intel's latest Haswell Core i7-4700MQ powerhouse is installed. It is a quad-core processor with Hyper Threading support. Therefore, not only four but eight processor cores are displayed in the operating system. A few programs benefit evidently from the possible better utilization of the processor cores via HT. The 4700QM's default clock is 2.4 GHz and can be increased up to 3.4 GHz via Turbo. Even when several cores are fully loaded, the CPU often reaches 3 GHz. The processor is built in a state-of-the-art 22 nm process directly by Intel. The manufacturer specifies a maximum TDP of 47 watts. However, this rate includes the integrated HD 4600 GPU so that a lower rate is likely achieved in pure CPU computations. The Turbo almost always achieved its 3 GHz when all cores were loaded in the test with Prime95 and other CPU-demanding tools. That is, for about a quarter of an hour when the laptop's cooling system ran at full speed. The cores quickly came close to the 100 °C temperature limit and the CPU throttled its clock rate. It is agreeable that the processor only downclocked to at most 2.8 GHz even after an hour of full load on CPU and GPU and did not drop below its default clock of 2.4 GHz. The Turbo is generally extremely reduced in battery mode although the energy-savings options are set to "High Performance". Although the laptop is not much quieter it is considerably cooler. Nevertheless, the user interface subjectively appears swift in battery mode, despite full load on all cores and GPU. Weaker processors slow down the system too extremely here to even browse on the internet pleasantly. A look at Cinebench reveals that the processor fares very well and calculates on a high level. 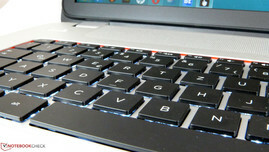 Older laptops based on quad-core CPUs from the Ivy Bridge generation, such as Acer's Aspire V3-771G, offer roughly 10% less power. It obviously gets a bit too warm in the Toshiba S50-A-10H's casing. The Envy 17 clearly calculates much faster than the 15-inch contender. In everyday use, the Envy 17 is subjectively fast when one application demands the CPU owing to its swift quad-core processor. We do, however, painfully miss an SSD, even just a small model for the operating system and frequently used applications. A solely hard drive powered laptop does not cause envy in the Fall of 2013. HP has missed the goal in this point. However, the laptops we chose for comparison do not sport an SSD either and all models score identically well in PCMark. Acer's Aspire V3-771G slightly lags behind with its older quad-core and Toshiba's Satellite S50-A-10H apparently still suffers from its tight casing and the resulting CPU throttling. 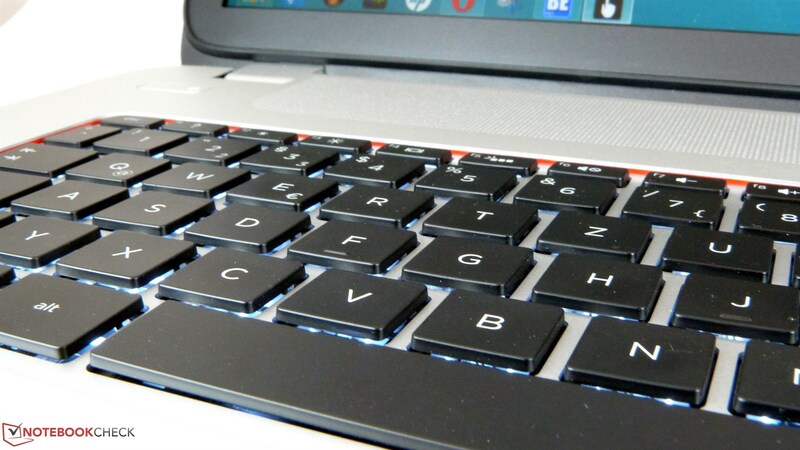 Nevertheless, the Envy 17's performance is overall convincing. Routine tasks, such as image editing, video editing, office and the like, do not overtax the laptop. Quite the opposite is true: HP's device even has reserves for the future. The 1 TB hard drive in HP's Envy 17 does a good job. It proved to be sufficiently fast for a laptop hard drive in the relevant benchmarks. 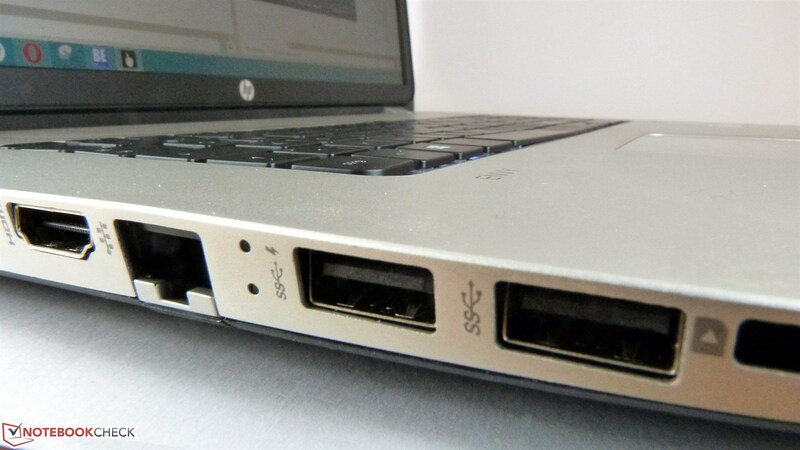 However, Hewlett Packard's laptop lacks an SSD cache or an SSD just for the operating system although there is an empty 2.5-inch slot for such a drive. Although the Envy 17 manages a satisfactory in the total score for the storage device, the lack of an SSD does not let the laptop really seem speedy despite the impressive CPU power. The hard drive's maximum transfer speed is 111 MB/s and its average transfer speed is still a good 84.9 MB/s but no hard drive comes close to the swift access rates of an SSD. The model installed in the Envy 17 is also in the lower midfield with an access rate of 17.2 ms.
HP's Envy 17 does not feature an mSATA slot. 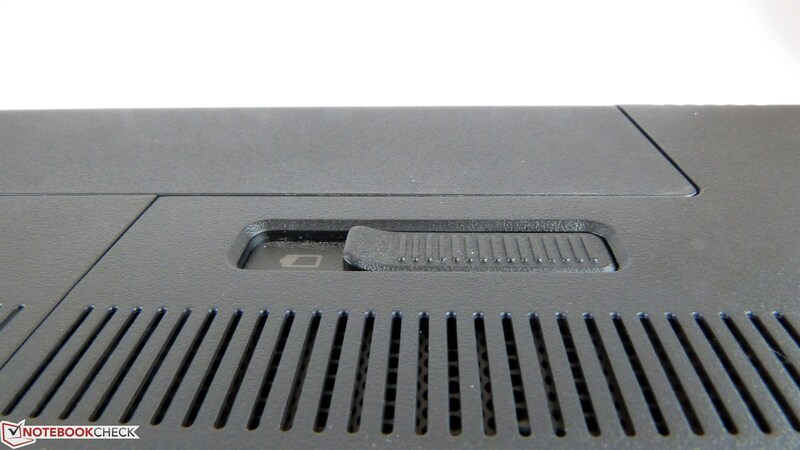 To use the empty drive slot (easy to access under the maintenance cover), a chassis and matching cable are required. It is thus not possible to simply and quickly install an additional SSD. Besides Intel's processor-integrated HD 4600 GPU, HP's Envy 17 also sports a dedicated graphics chip from Nvidia. The GT 740M is supported by 2 GB of DDR3 RAM and offers a considerably higher performance than Intel's GPU. The latter is always enabled via Nvidia's Optimus when no 3D load is demanded. This saves energy and HP does not completely disable the very useful features of Intel's graphics. For example, the HD 4600 encodes videos faster than Nvidia's GPU or even the CPU owing to the hardwired converter via Quicksync. Basically, the Kepler graphics solution from Nvidia could be quite suitable for gaming. However, HP has incorporated a few barriers for the chip. Nvidia pretty much allows manufacturers to handle freely and HP connects the GPU with an only 64-bit memory bandwidth to the rather slow DDR3 RAM. This slows the state-of-the-art GK208 graphics chip noticeably so that games rarely run smoothly in the native screen resolution. The 740M does not break any performance records with 384 shader units and the comparatively slow memory. It also proved to be rather restrained in the benchmarks. Users who are planning to play on the Envy 17 will have to make compromises in resolution and graphic details. The 740M is naturally defeated in a direct comparison with the more expensive and faster models from the series. The GTX 765M in MSI's GE70-i765M287 is twice as fast particularly in tests with high resolutions. With exception of the screen size, the almost identically equipped Toshiba Satellite S50-A-10H shows some differences. Toshiba's laptop lags clearly behind in CPU performance, e.g. in 3DMark's physics test, but regains ground in GPU performance compared with the Envy 17. The reason for the relatively low graphics power is: HP only connects the GPU and graphics RAM with a narrow 64-bit bus. Nvidia leaves this up to the laptop manufacturers although using a GDDR5 and 128-bit bandwidth would be possible. 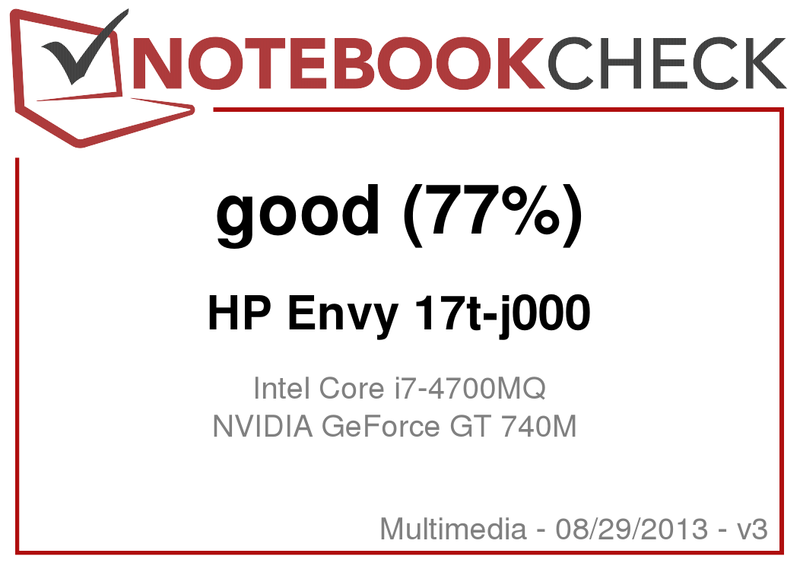 Thus, the Envy 17 sets the lowest mark for the performance of a GT 740M. It would only be slower with throttled clock rates. But this is fortunately not the case. The GPU still clocked with 1058 MHz even in longer load periods owing to the GPU Turbo. The bandwidth will rarely be sufficient for games in 1920x1080 pixels and is more for older games. HP's Envy 17 is definitely not a pussyfooter. At least not when it is loaded or the hard drive is spinning. The fan is permanently active in less demanding tasks, such as Office. We ascertained a maximum of 32.4 dB(A) at a distance of 15 cm in front of the laptop. The noise increased to 36.7 dB(A) when a DVD was read. The fan ran very inconspicuously in idle and allowed concentrated working. This was only occasionally interrupted by the noise from the hard drive when enabled. The fan increased its speed extremely during load and produced up to 46.7 dB(A). Concentrated working is difficult at this noise level. The Envy 17 proved to be hotheaded particularly in the vent's area. The load temperature exceeded 47 °C here. 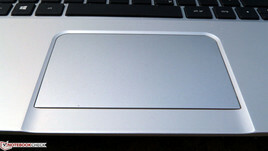 However, the area around the wrist rest also felt unpleasantly warm after a while of intensive computer work and graphically demanding games. It is almost impossible to convert a video or play a game when the laptop is resting on the thighs. The user would have to wear thick, insulating pants for this. The processor achieved its maximum temperature limit within a few minutes so that clock rate reduction prevented high Turbo levels. Thus, the Turbo rate was rarely maintained for long. When the Envy 17 ran consistently at 3 GHz (on all four cores in load), the clock rate dropped with increasing temperatures to 2.4 to 2.7 GHz after a while. However, the Envy 17 never throttled below its default clock. This is not noticed in routine use. Video converting needs a bit longer and a few fps are lost in games. The GPU is not affected. The GT 740M continued to run with its maximum Turbo rate of 1058 MHz even after over an hour of CPU and GPU load. 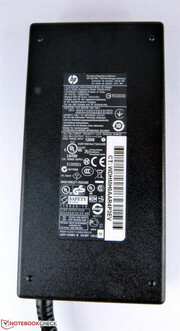 HP refers to the audio solution from Beats Audio in several places on the casing. 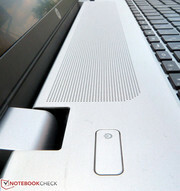 The laptop's sound is produced by four small speakers and a little subwoofer that radiates toward the surface. We would have expected more here. The effort is not worth the presented sound experience. Music sounds like it is coming out of a tin can and completely lacks mids. However, there is a slight hint of bass and a lot of very overemphasized trebles. The volume should not be set over 50%. The sound rattles in higher volumes and music turns into a treble-heavy screech concert. We do not believe that the Envy 17 can fill more than a small room with sound. 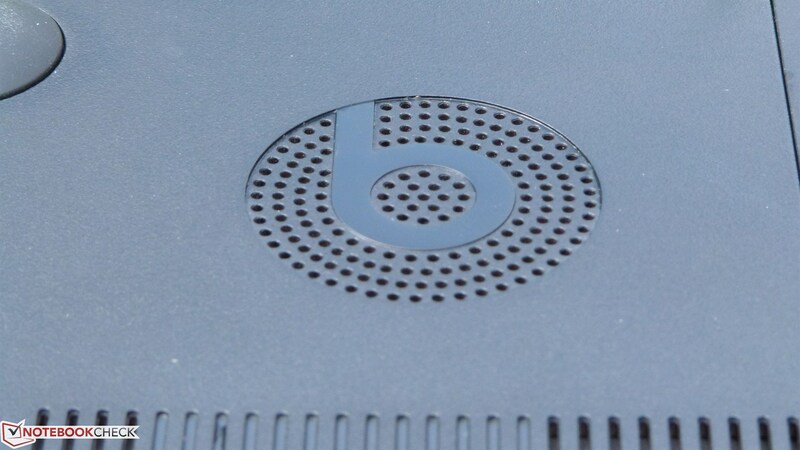 Even then, the sound will likely not at all meet the expectations that are created by the eye-catching Beats Audio logo. As expected, connecting an external sound system via the 3.5 mm jack improves this condition. The Beats Audio sound management does not improve the integrated speakers sound either. It is inconvenient that HP does not use a separated microphone and speaker jack and only installs a combo jack for external speakers. The advantages of the Haswell architecture and the optionally usable Nvidia graphics are seen in low load. The Envy 17 only consumes 14.6 watts even with maximum screen brightness. This is quite a good rate for a 17.3-inch device. It is even only 7.9 watts with minimum screen brightness and 0.6 watts in standby. The power consumption climbs up to 69.7 watts during pure CPU load. Haswell is not known for working economically during load. However, the power consumption drops by over 10 watts when throttling occurs or the Turbo is not maxed out due to the system's temperature. The Envy 17 consumes a maximum of 40.3 watts with low CPU but even higher GPU load (on Nvidia's GPU). When both the processor and graphics card are loaded, for example like in our test using Furmark and Prime95, the Envy 17 treats itself to a bit over 70 watts from the mains. 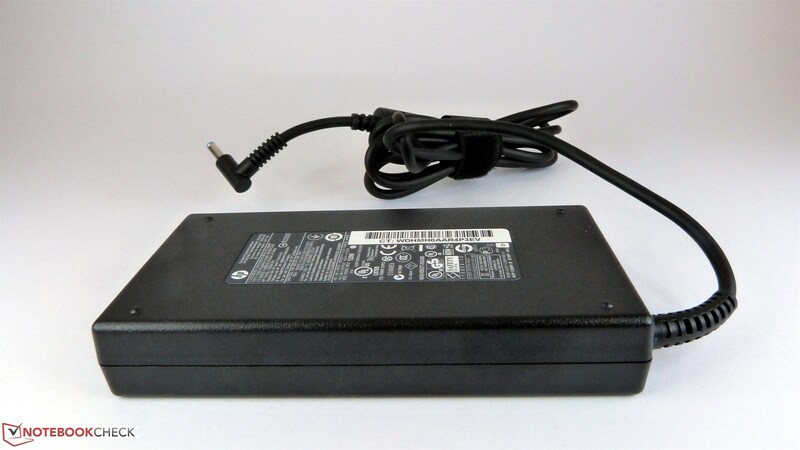 The power supply copes well with this due to its capacity of 120 watts. 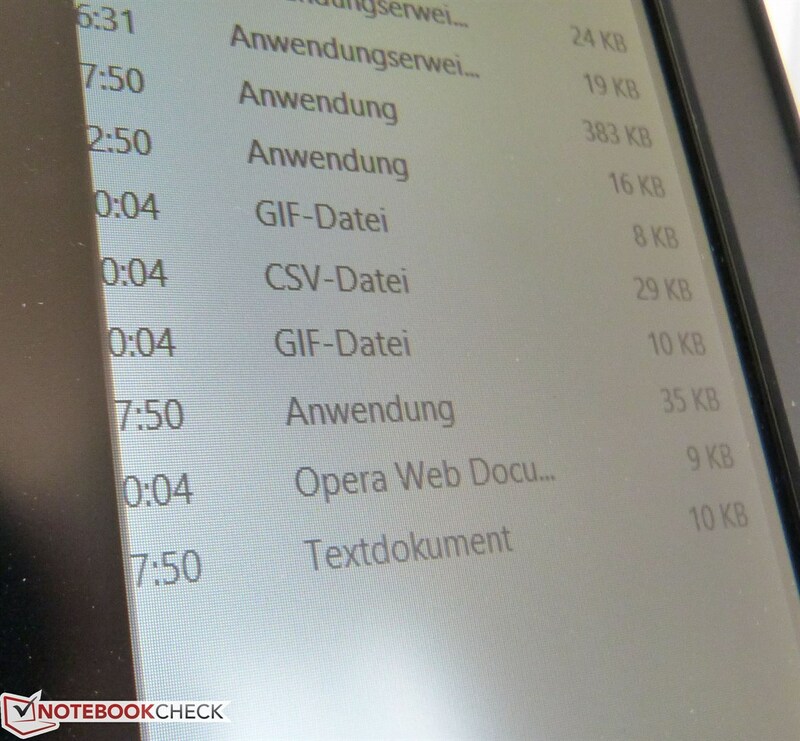 At least the Envy 17 proved to be enduring in the Reader's test, using a dimmed screen, with over 6 hours of runtime. It was still a good 3 hours in the Wi-Fi test where different websites, some with videos, are opened every 40 seconds. The DVD runtime was also satisfactory. The energy hunger first became obvious when the hardware's power was unleashed via the "High Performance" energy mode. The Envy 17 could not last for an hour in the Classic Test of Battery Eater's test tool. 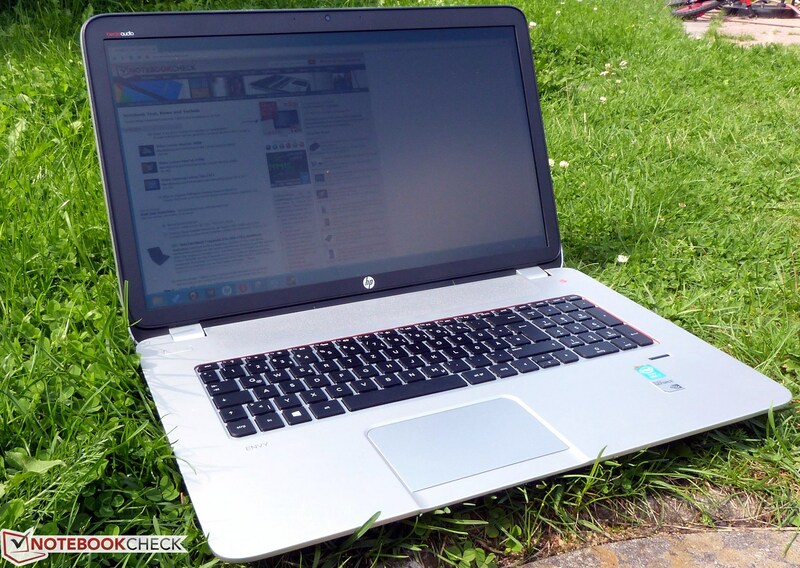 Users of HP's Envy 17 want to make others jealous, or envious. They may even feel annoyed about their small and apparently slower device when taking an only superficial glance at the laptop. However, feeling envy is not throughout appropriate. 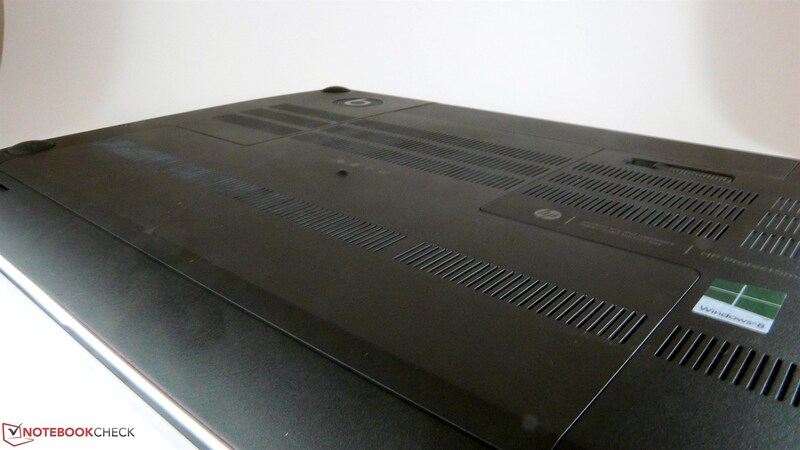 Hewlett Packard demands 999 Euros (~$1315) for the j003sg version of the Envy 17. In view of the generous processor configuration and the decent screen, it is not an exaggerated price. 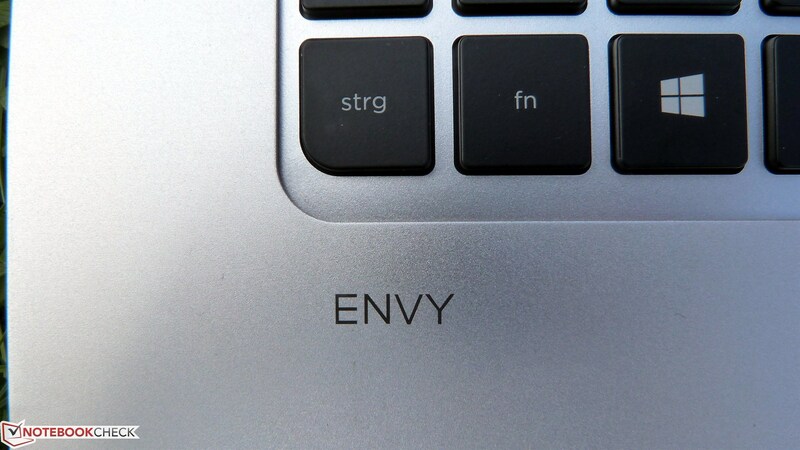 Nevertheless, we would have hoped for more from the Envy 17. The reduced memory bandwidth and the generally low performance of the GT 740M is aggravating when the laptop is to be occasionally used for a relaxing 3D game in the native screen resolution. A higher-quality casing would be another item on our wish list. The battery's load runtime cannot be mentioned positively, although the laptop's idle runtime is compelling, which takes us to the positive points. The screen is mostly appealing and supplies surprisingly good color accuracy when it has been calibrated. The Envy user does not need to fear sunny days owing to the matte surface either. The 12 GB RAM offers a small advantage in a few applications. The processor is agreeably swift and the laptop remains quiet when it is not demanded too much. However, its high temperatures and a disturbingly loud fan are annoying. The i7 quad-core takes its toll here. Acer's Aspire V3-771G does a better job and is also the better overall offer despite last year's components. MSI's GE70-i765M287 should be preferred when gaming is an issue besides work because of its much faster graphics solution. Although a few interfaces are installed, they have all been placed inconveniently in the front area. Users can use the fingerprint scanner instead of passwords when preferred. Envy, jealousy - the logo almost looks shy. A discrete manufacturer's logo adorns the back. The Envy 17 definitely does not lack manufacturer emblems. The battery suffices for a good runtime. At least in low load. The power supply provides enough energy with 120 watts. It is neither too big nor exceptionally small. 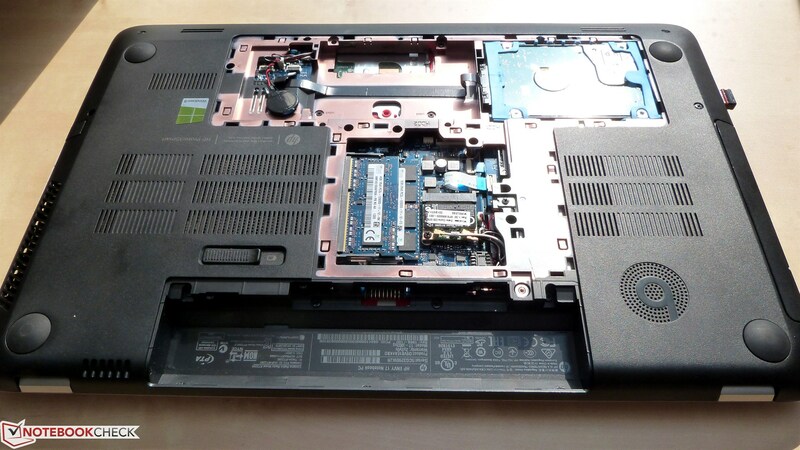 The battery has to be taken out before the laptop can be opened for maintenance. Only one screw has to be removed to access the innards. Here we find the BIOS battery and an empty slot, for example for an SSD. The hard drive with a capacity of 1 terabyte is already installed. An empty slot is located beside the hard drive. Unusual match: Two RAM modules with 4 GB and 8 GB. 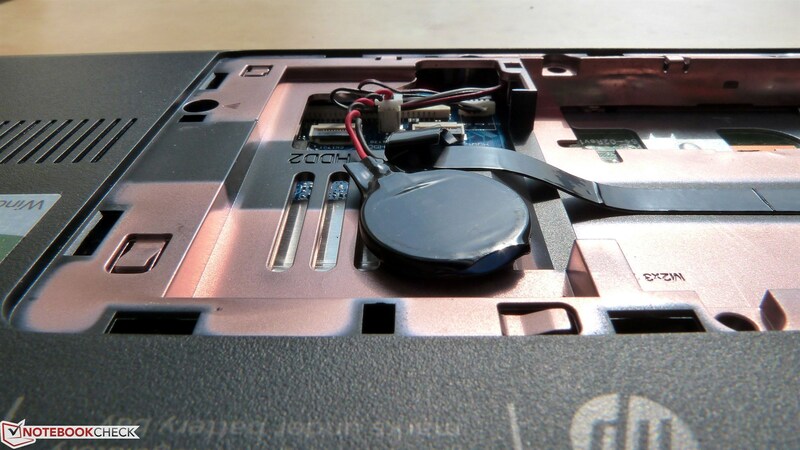 The DVD drive of HP's Envy 17. Speakers are found everywhere on the casing. It's too bad that doesn't improve the sound. Beats Audio is plainly advertised in any case. A little subwoofer is to ensure rich sound. To no avail, regrettably. More speakers on the underside. The "subwoofer" in Beats Audio style. Handy: the Envy 17's keyboard is illuminated. An orange rim sets careful color accents. The decent Full HD screen ensures a crisp picture. Content can be seen even in the sun. 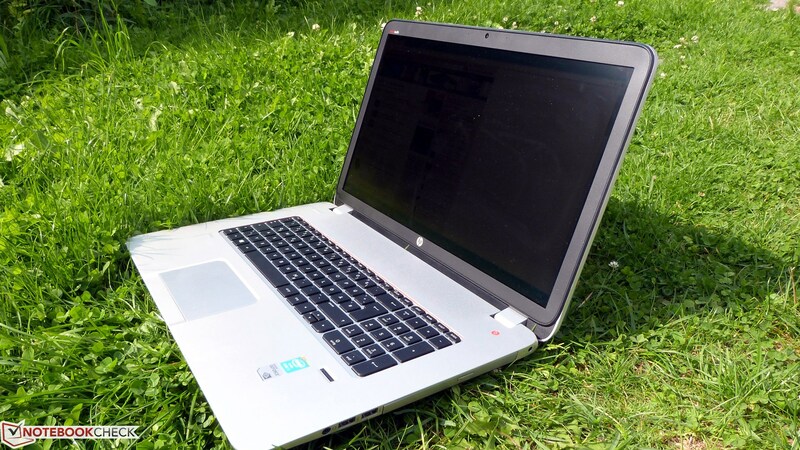 Looks good even on wild meadows: HP's Envy 17. A bit further and the screen closes completely. The display hinges don't really have a firm hold. Thus, the display always wobbles a bit. The display: Not too thick yet rigid. The webcam shoots satisfactory pictures. It is possible to work well with the Envy 17's touchpad. The screen remains legible even with light from the back. The quad-core processor supplies high computing power. Working with the Envy 17 is really fun. The decent screen is also compelling after it has been calibrated. A more sensible interface positioning and a higher quality casing are at the top of our wish list. That's followed by an SSD. 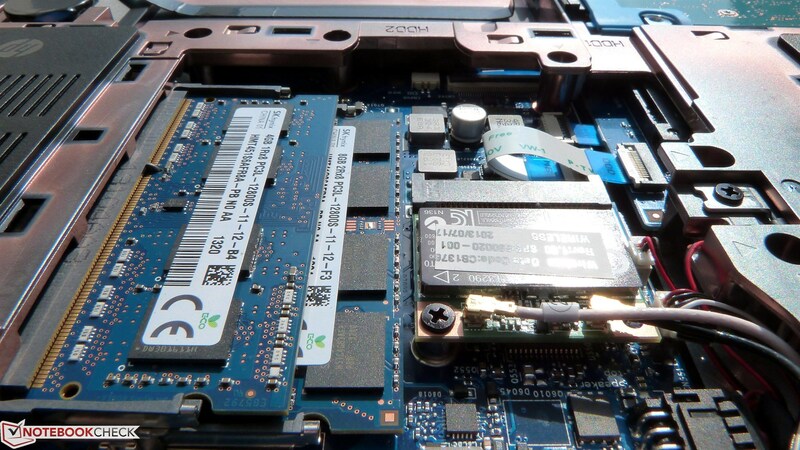 Quad-core computing power and a lot of RAM even make some desktop replacements seem obsolete. However, we are primarily baffled about all the opportunities that HP leaves unused and also mourn over the lack of an SSD as well as the screen's rather extreme bluish cast in an uncalibrated state. The same technology but a smaller casing: Toshiba Satellite S50-A-10H. More graphics power is found in the MSI GE70-i765M287.